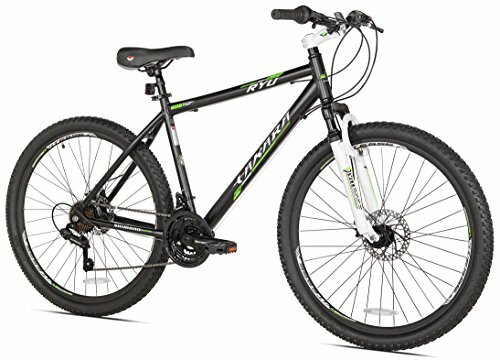 Does it matter whether my bike has lots of gears? Is it best to buy the most expensive mountain bike? Cycling is one of the best forms of exercise, and it can also be the most enjoyable if you select a beautiful trail. Choosing a high-quality mountain bike with a good number of speed levels and effective suspension can ensure that your mountain bike works with you regardless of the terrain or the weather conditions. One of the prime decisions to make when choosing a mountain bike to purchase is the wheel size, as choosing a wheel size which is either too small or too big for your height can be detrimental for your riding experience. We have reviewed ten of the best mountain bikes currently on the market in 2019, each costing less than $300, so that you can decide which is the best mountain bike for you and your needs. 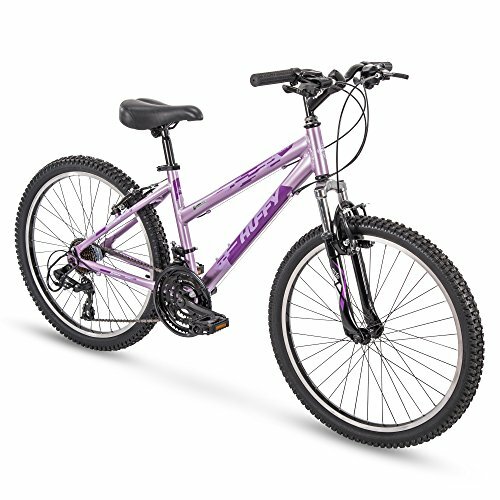 The Schwinn High Timber Mountain Bike offers 20-inch wheels within a mountain-style frame, available in either a purple design or a blue and green color choice. 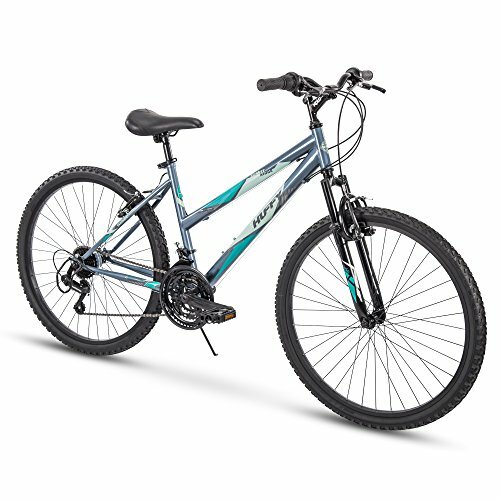 Features include the Schwinn suspension fork which enables a durable ride and an enjoyable experience. Providing seven-speed Shimano twist shifters in addition to a Shimano rear derailleur, this mountain bike offers effortless gear changes for a high-performance and a smooth ride. Offering alloy linear-pull brakes ensures that your mountain bike will stop in all weather conditions, even in mud. Additionally, you can be assured of a reduction in maintenance, with the inclusion of the light alloy rims. The Schwinn High Timber Mountain Bike comes complete with a limited lifetime warranty and weighs around 30 lbs. Why We Liked It – The inclusion of the seven-speed Shimano twist shifters and the Shimano rear derailleur ensure that the Schwinn High Timber Mountain Bike is a safe and durable purchase, ensuring high performance and an enjoyable experience every time. Furthermore, you will spend less time cleaning and maintaining this bike due to the effective, strong and light alloy rims. 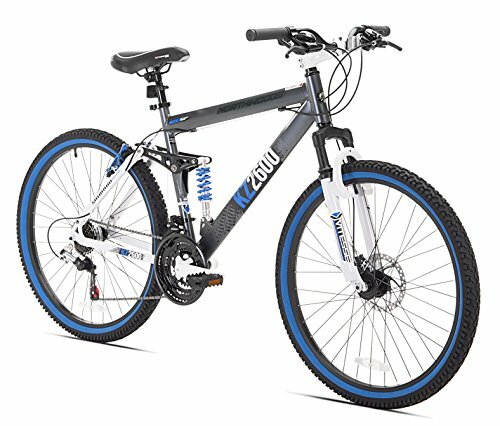 The Kent KZ2600 Dual-Suspension Mountain Bike offers 26-inch wheels in addition to a full suspension aluminum MTB frame. 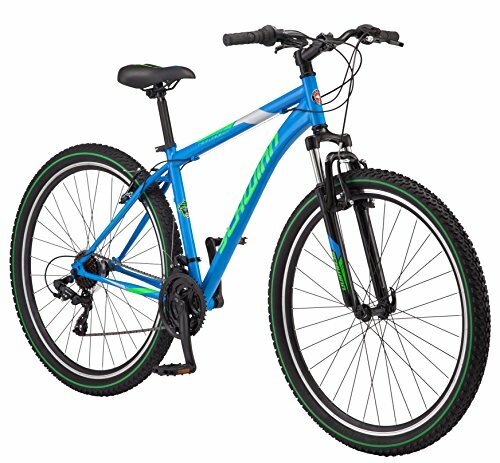 Available in a granite color choice with stylish blue flashes surrounding the rims of each wheel, this mountain bike definitely stands out from the crowd. Featuring Shimano 21-speed shifters in addition to a rear tourney derailleur, this mountain bike offers you versatility and the competitive edge desired by such a bike. Providing both disc brakes and alloy wheel rims, you receive every desirable feature you could think of with this purchase. The Kent KZ2600 Dual-Suspension Mountain Bike weighs around 39.9 lbs. Why We Liked It – The Kent KZ2600 Dual-Suspension Mountain Bike provides a unique and stylish color design and features which will make you the envy of the bike circuit. The Shimano 21-speed shifters provide numerous options for your cycle ride, regardless of the terrain, the trail or the weather conditions. 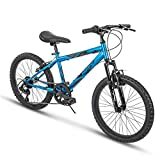 The Huffy Mountain Bike Summit Ridge Mountain Bike is available in six different color choices, from subtle charcoal to a sublime denim blue or a metallic cyan. If brighter colors are more your taste, this mountain bike is available in a fiery red, a patterned purple or a youthful solar flare pink. Features include 21-speeds to provide you with multiple gear options, adapting to every possible terrain, weather condition or trail. Providing 26-inch wheels in addition to an adjustable seat, this mountain bike can certainly go the distance. Why We Liked It – The Huffy Mountain Bike Summit Ridge is a stylish and powerful mountain bike available in a range of six unique color choices. Our favorites are the bright pink solar flare choice with shadows of black as well as the sublime denim blue design which contains flashes of yellow. 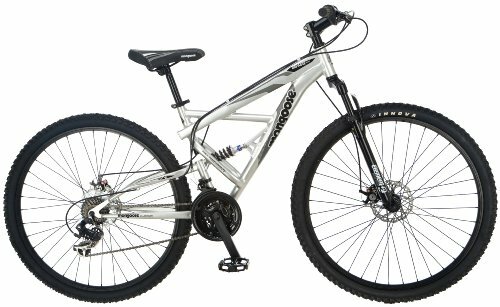 The Mongoose R2780 Impasse Dual Full Suspension Bicycle is available in a trend-setting silver color choice in addition to unique frame design. The 29-inch wheels and aluminum suspension frames provide comfort and durability throughout each and every journey, with the element suspension fork smoothing the terrain regardless of location. Features include 21-speed Shimano rear derailleur in addition to SRAM twist shifters to allow you to change gears easily. Included within the mountain bike are alloy wheels with a quick release front, as well as an alloy front and rear disc brakes. The Mongoose R2780 Impasse Dual Full Suspension Bicycle weighs around 44 lbs and features a limited warranty with your purchase. Why We Liked It – Featuring 29-inch wheels and 21-speed Shimano rear derailleur and additionally SRAM twist shifters, the Mongoose R2780 Impasse Dual Full Suspension Bicycle is the ultimate mountain bike. Furthermore, the sleek color and unique frame design is a stylish and winning choice. Featuring 24-inch wheels, the Huffy Escalate 21 Speed Hardtail Mountain Bike presents a strong purchase. Available in four different color choices, you can choose from a gloss black, a gloss lavender, a gloss nickel or a metallic mint. The mountain bike is shipped partially assembled, requiring less effort from you before you can begin your cycling journey. Regardless of the trail or the terrain, the front suspension provides an accurate response whatever the weather. Additionally, the ATB-type resin pedals ensure that they are fully responsive at all times, while the Krayton grips ensure that you are always comfortable during your ride. Why We Liked It – If you are of shorter height, then the Huffy Escalate 21 Speed Hardtail Mountain Bike could be the perfect choice for you, providing numerous stylish design choices in addition to a powerful 21-speed function. 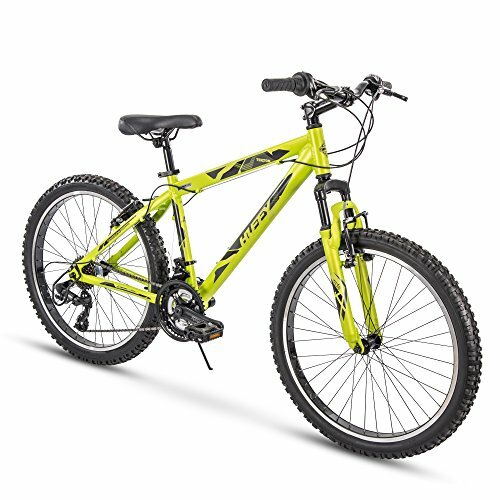 The Huffy Mountain Bike Aluminum Frame 21 Mountain Bike provides 24-inch wheels in addition to three unique color designs of matte acid green, satin tropic blue, or matte black. Furthermore, the ATB-type resin pedals ensure that they are fully responsive at all times, while the Krayton grips ensure that you are always comfortable during your ride. Regardless of the trail or the terrain, the front suspension provides an additional, accurate response whatever the weather. Why We Liked It – The Huffy Mountain Bike Aluminum Frame 21 Mountain Bike is a great design choice for teenagers or those who are young at heart. The ATB-type resin pedals are a strong feature, as are the sought-after Krayton grips, providing a safe, reliable and enjoyable ride each time. 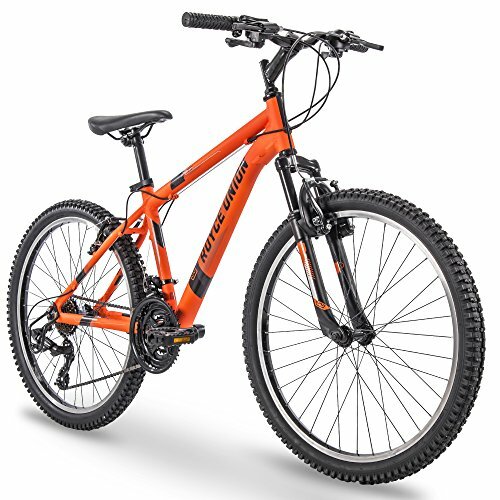 The 24″ Royce Union RTT Men’s 21-Speed Mountain Bike provides 24-inch wheels and is available in striking matte tangerine color design in addition to a further seven color choices. Featuring a lightweight yet durable aluminum frame, this mountain bike provides smooth and easy handling across any terrain. Possessing 21-speeds, the smooth trigger shifting provides an enjoyable ride while the lightweight alloy linear pull brakes encompass machined alloy wheel rims to enable superior contact for the brake pads to achieve effective stopping power. Why We Liked It – The eight color choices offered with the 24″ Royce Union RTT Men’s 21-Speed Mountain Bike ensures that there is a design choice to suit every taste. Our particular favorite is the matte tangerine color choice, presenting a desirable rust orange color to set alight your favorite trail. The Takara Jiro Dual-Suspension Mountain Bike provides 27.5-inch wheels and an aluminum dual-suspension frame, offering a smart purchase. Features include Shimano tourney derailleur in addition to Shimano Revo twist shifters, providing a smooth and reliable ride. Additional features include both front and rear disc brakes, ensuring that the mountain bike stops when you need it to. The Takara Jiro Dual-Suspension Mountain Bike weighs 47.2 lbs and is available in a stylish matte black color design. Why We Liked It – The Takara Jiro Dual-Suspension Mountain Bike is available in a stylish matte black color choice and contains all of the features desired in a mountain bike. The Kingttu EURG6 Mountain Bike comes with 26-inch wheels and is available in a choice of two color options, army green or neon blue. 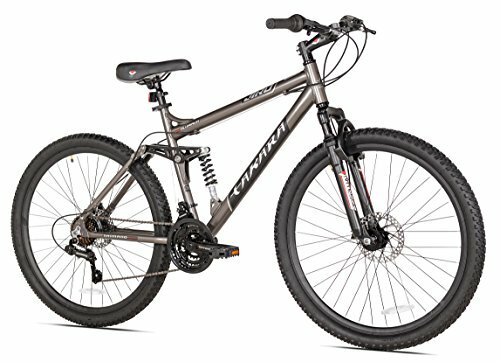 Possessing 21-speed Shimano front and rear derailleur and shifter, you will receive a sturdy mountain bike and a reliable purchase. This dual suspension mountain bike feels light and easy to maneuver while the dual disc brakes ensure the perfect stopping power. The three-spoke fashion rims provide ease of use and control while the mountain bike itself is shipped almost fully assembled, requiring much less time and effort from you before you can begin riding. The Kingttu EURG6 Mountain Bike weighs a total of 42 lbs. Why We Liked It – The style of the Kingttu EURG6 Mountain Bike will impress anyone who you pass on the trail, with stylish three spokes featuring on the wheels and the strong and unique frame adding to the aesthetic qualities. Our favorite color choice is the army green design, featuring a trendsetting pattern. The Takara Ryu Front Suspension Mountain Bike features 27.5-inch wheels and an aluminum frame. Offering front suspension and Shimano Tourney derailleurs, this mountain bike provides Shimano Revo twist shifters as well as front and rear disc brakes. Being available in a matte black, this mountain bike will look sleek as it powers through every trail. Weighing at around 44 lbs, the Takara Ryu Front Suspension Mountain Bike comes almost fully assembled to save you time and energy, requiring you to solely fit the front tire and handlebars. Why We Liked It – If you are looking for a sleek mountain bike which looks great on the trail, then the Takara Ryu Front Suspension Mountain Bike could be the purchase for you, featuring all of the desirable bike features you would expect from a quality bike. 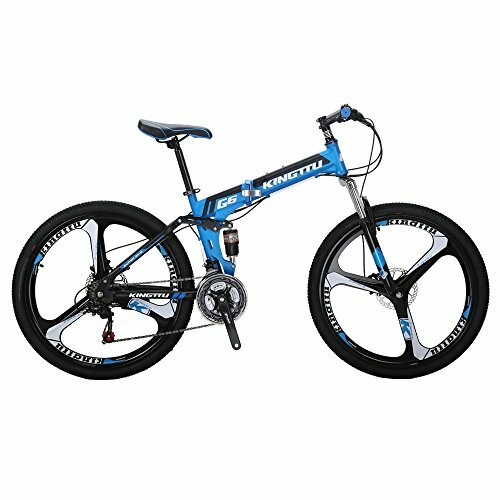 When looking for a mountain bike, there are certain features of the bike which you should look for in detail. For example, the materials and the style of features included are very important, as are the suspension and gear details which will affect your cycling experience. We have compiled a list of features to specifically look for when purchasing a new mountain bike. While the shape of the frame may be favored due to taste and aesthetics, the material of the frame certainly possesses some significance in terms of cycling capability. Cheaper bikes will include steel in the material used for the frame, which can be heavy and can be a hindrance for your cycling performance and ease of use. Finding a mountain bike which uses aluminum as the frame material may be costly and cause you to reach the upper ends of your budget, but aluminum is much lighter, resulting in easier maneuverability and a faster speed time on the trail. A higher amount of gears available on your mountain bike provides you with additional options and versatility. When cycling up a steep hill, a higher number of gears will mean that you can change gear in smaller steps, achieving an increase in precision and a more effortless ride. An ideal minimum number of gears is having nine gears towards the rear of your mountain bike, being paired to a crank possessing three rings at the front of the bike. The ideal type of brake to feature on your mountain bike is a disc brake, providing effective performance in comparison with the traditional brakes which squeezed the wheel rim in order to stop. Additional stopping power can be found if your brakes use the hydraulic fluid as opposed to the traditional cables. This will further ensure that your mountain bike will require less maintenance. Choosing the right type of mountain bike tires will vary on what you will be using the mountain bike for. For example, if you will be carrying out your daily work commute, then typical mountain bike tires will suffice. However, if you are considering riding off-road across varying terrain, then you will require tougher tires. A bonus for off-road riding is the inclusion of a suspension fork, although mountain bikes which contain this feature can be expensive. A rigid suspension fork may be a good option to keep costs low, particularly if it is fitted for a cheaper bike. Look out for mountain bikes which claim to possess full suspension. This is a perfect feature and is when the bike has suspension at the front wheel and the back wheel. The size of your mountain bike wheels is very important. If the wheels are too small for your height, then you may find that your legs are squashed up, proving to be an uncomfortable ride. If your wheels are too big for your height, then you may find it a struggle to sit on the bike never mind ride it. First of all, you must accurately measure your height in feet and inches. The best way to do this is to stand against a wall and mark the top of your head measurement with a pencil. Then take a tape measure and measure the wall from the floor up to the pencil mark. Next, follow the manufacturer’s instructions to find out what size mountain bike you will need. Typically, a 24-inch wheel will fit an individual who is around 5-feet tall while a mountain bike with 26-inch wheels will fit most individuals between 5-feet and 6-inches tall through to 5-feet 10-inches tall. You can find mountain bikes with bigger wheels, however, if you are a taller height than this. A: This depends upon what you want from your bike and where you will be using your bike. If you will be gently riding across flat surfaces, then gears may not be the most important feature on your desired list. However, if you plan to ride off-road or up steep hills, then gears are most definitely your friend. Gears will help you when you need it most and may help to prevent injury to your joints. A: Not necessarily. You need to assess what you are looking for in a bike along with your average usage. If you have set $300 as your budget, then looking for an aluminum frame with a good set of gears and suspension should be top of your list of priorities. Spending less than your budget on your bike may free-up some cash for a good trail helmet, providing your head with a great set of coverage, an effective peak and constructed strongly. Glasses are also useful, particularly for riding off-road, protecting your eyes from flying dirt and debris. Bike shoes may also be a good investment for you, enabling a better power transfer from your feet to the pedals. Additionally, you may find it useful to carry a backpack when riding, ensuring that you have your water bottle, your phone and any other items you may potentially need, particularly in an unexpected emergency. When riding off-road, you may be riding within deserted areas, and so phone to communicate with the emergency service is vital if you should suffer from a fall or an accident.